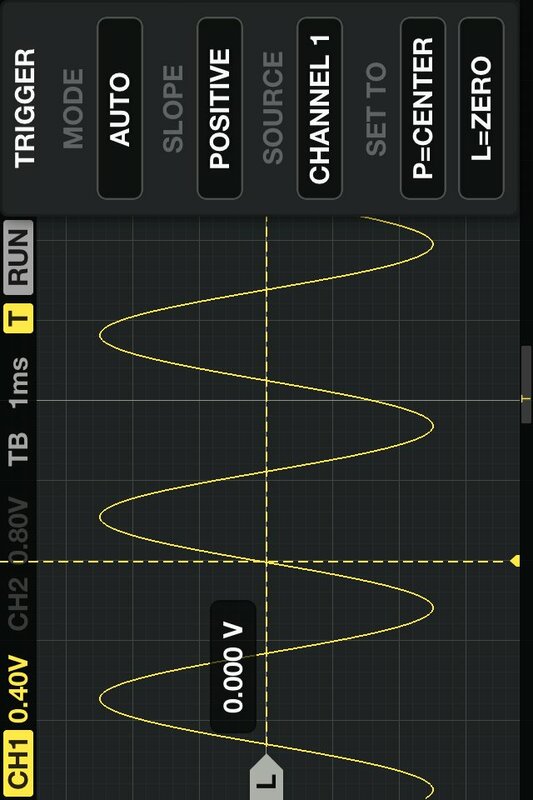 Oscilloscope app is great for analyzing audio range signals, or learning oscilloscope measurement basics. The interface includes many standard oscilloscope controls, such as: triggering, time and voltage per division, signal measurement cursors, and more. The app incorporates a signal (function) generator capable of generating sine, square, triangle, and sawtooth waveforms of up to 22 KHz. Calibration to an external reference signal is supported, guaranteeing the accuracy of measurements. Input can be acquired via the built-in microphone or an external mic/probe connected to the headset connector. For best results, use an external audio interface connected to your device dock. This allows for standard audio equipment to be connected, as well as for dual channel input. Oscilloscope probes also be connected (using a BNC connector). When feeding external signals via probes, you should take care not to exceed 1V AC voltage. Currently iDevices support only AC input.